Are you looking for a translation provider for your African language translations? We can help you with translations in one of the thousands of languages spoken on the African continent. The African continent is rich in an incredible variety of ethnicities, languages and cultural traditions. Experience and know-how are essential when translating to or from one of these languages. All our translators are carefully vetted to ensure African language translations and interpreting are of the highest quality. We offer our African language translation services for legal documents, websites or medical reports and a lot more. Click on the icons if you want to find out more about the types of translations we support. Why choose Wolfestone as your translation service provider for the African continent? Wolfestone has worked with a range of clients on projects in a number of African languages, both major ones such as Swahili, Igbo and Somali, and minor ones, such as Krio or Akan. All our translators are native speakers of the target language and can successfully guide you through the cultural difference with attentive and qualified services of transcreation and localisation. Our clients are always offered transparent quotes and constant communication to check the progress of their requests. Our translation and interpreting services have proved a popular choice amongst different options across a range of sectors and industries. Our customer satisfaction is among the highest in the industry (99.6% in 2016). 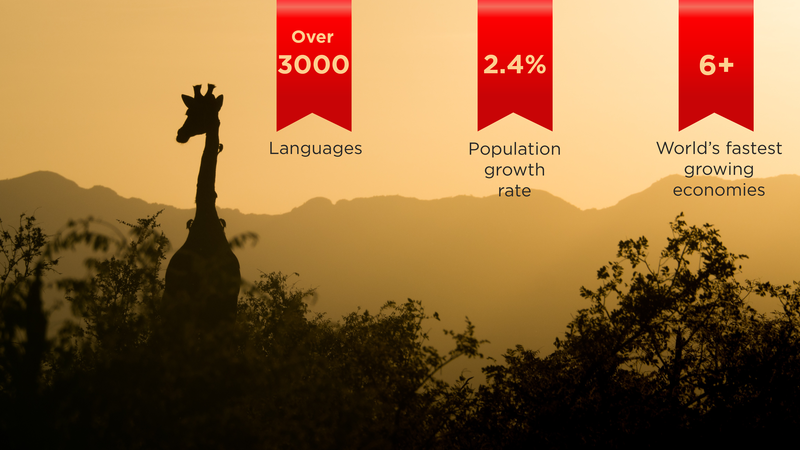 Our most frequently requested languages from African countries are Afrikaans, Nigerian languages and Somali. Are you in need of expert Afrikaans translation services? As one of the UK’s leading translation companies, Wolfestone can help. Afrikaans is spoken by around 8 million people primarily in South Africa and Namibia. It’s a language that evolved from Dutch and around 90% of its vocabulary is derived from the European language. Are you looking for a language services provider for your Nigerian translation needs? Wolfestone has the experience and quality you’d expect from a company that chairs its trade body. Despite the fact that English is Nigeria’s official language, its percentage of English speakers is said to be around 53%. It has over 520 other languages including Hausa, Yoruba, Igbo, Ijaw and Tiv. Looking for a language services provider for your Somali translation needs? Wolfestone has the experience and quality you’d expect from a company with over 10 years of experience in the field. Somali is an Afro-Asiatic language, belonging to the family’s Cushitic branch. It is spoken by ethnic Somalis in Greater Somalia and the Somali diaspora. It has an estimated 17 million speakers. Wolfestone offers accurate, high-quality Swahili translation, interpreting and multilingual SEO services across a range of sectors and service levels. The estimated number of Swahili speakers varies from around 50 million people to a 100 million people. Part of the Niger Congo language family, it is the national language of Tanzania, Kenya and the Democratic Republic of Congo. Please contact us if you require a translation for an African language that is not listed here. The African continent is the second most populous continent after Asia and covers 6% of the Earth’s total surface, stretching across several parallels, from the northern temperate areas to the equatorial and tropical areas of central Africa, again to the southern temperate areas. It’s home to 54 sovereign states and various territories with discussed recognition. The total estimate of the amount of African languages that exist varies between 1 and 3 thousand. These languages divided into 6 major language families, which are generally geographically distributed. Language policies are essential in Africa due to the sheer volume of languages, and nowadays most states are aiming at multilingualism, in order to preserve the cultural heritage connected to minority languages. Africa has several growing economies and, according to figures taken between 2008 and 2016, the continent’s GDP is increasing by around 4.0% annually. Traditionally considered as under developed, Ethiopia, Ghana and Cote d’Ivoire’s economies are said to be growing at some of the fastest rates on the planet. The 7th most populous country on earth, Nigeria, is situated on the continent, and with a population of a 186 million people along with one of Africa’s richest cities Nairobi, further growth for the populated powerhouse is predicted. Contact us for more information on our African language translations.